While we have been looking forward to San Francisco for the Exploratorium, there is another science museum here – the California Academy of Science. We decided to build up slowly and start with the less famous one. Interestingly, it started out as the classic stuffed animal style museum, like the Australian museum in Sydney. But it has moved on now, helped by two earthquakes which have forced massive rebuilds and refocusing, and while its focus is natural history, it is almost a zoo, with a rainforest, and massive aquarium, as well as a planetarium. 1. The Museum must engage and excite – It almost felt like they had cheated here, by having actual live animals. Certainly Declan was bouncing around when we started seeing butterflies in the rainforest exhibit. This certainly engaged and excited us, particularly when we saw poison dart frogs and piranhas just like we had seen in the real Amazon rain forest. As an added bonus, we managed to get to four different talks teaching us something about the animals here. The snake one was our favourite, even though there were no actual animals involved. 9/10. 2. The exhibits must work and not baffle – Given most of the exhibits were actual live animals, it is hard to score this one. But Callum failed to figure out the exhibit where he was supposed to measure his carbon footprint. And the very sophisticated LCD screen based animal labelling system meant that it was actually hard to find out what some of the animals were unless you waited for the full set to scroll through 8/10. 3. A play area should not substitute for teaching science in the museum. We didn’t really find any push button play section. So it certainly didn’t substitute for anything. But then, apart from cool animals to see, there wasn’t all that much interaction, so I’m not sure I can score this full marks either. 8/10. 4. Televisions and computers are no longer, in themselves, cool, or more generally, everything should be up to date. We went to the planetarium, and I was impressed with how up to date that seemed. With the various probes that are looking at different planets, it is a bit of an effort to stay up to date. And the museum (after the latest rebuild) only opened in September 2008, so it would be embarrassing if it wasn’t up to date. 10/10. 5. Museums should tell a story. Our experience of this museum was quite bitty. 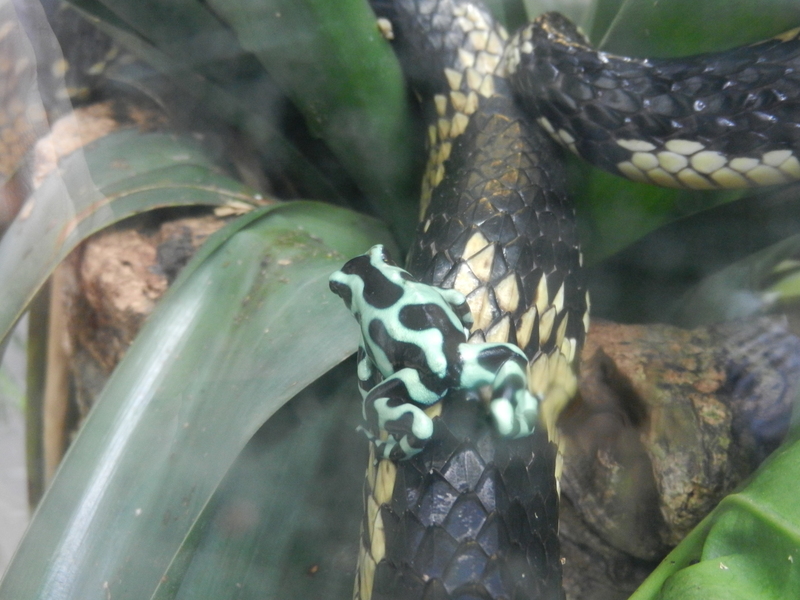 We saw snakes, birds of prey, rainforest, and a planetarium. But given where it had come from (they used to have a whole minerals gallery, for example), I was very impressed at how well they had focused on the natural history side of things, and how well they tied in actual research for anyone who was interested enough. So this museum did the story side of things reasonably well, but not perfectly. 8/10. Cafe factor: There was a major restaurant/cafeteria near the entrance, with delicious pastries and biscuits, and what looked like healthy food. One of the best we’ve seen in the US (but of course, with rubbish coffee). Expense: Very expensive by world standards, but standard for the US, from what I can see. A family of four costs $99.60, although there is a discount of $3 each if you arrive by public transport or (as we did) walking. On peak days (eg Thanksgiving) they add $5 per ticket unless you buy online.